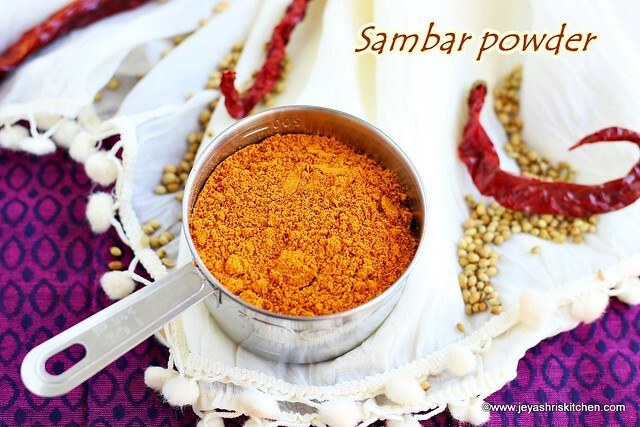 Sambar powder recipe| How to make sambar masala at home, South Indian style Sambar masala made using coriander seeds, red chili and other spices used for making sambar, rasam and curries too. Usually we make Sambar powder in bulk and it is grind in mill back in India. I have posted the bulk version of Sambar powder recipe long back, but is used to get mails for the recipe in small quantity, which can be made at home in small quantity. It was too difficult for me to work on the ratio and proportions and later i forgot. Last 2 weeks i got few messages in social media regarding the same. So i called my mom and we both discussed on the ratio for making sambar podi in small quantity and finally concluded with the measurements. I tried the same at home and it was quite flavourful too. For many readers who live in abroad, we run out of stock, those times this recipe will be handy. You can use the same podi for sambar, rasam, and curries like potato, cauliflower, ladies finger.. 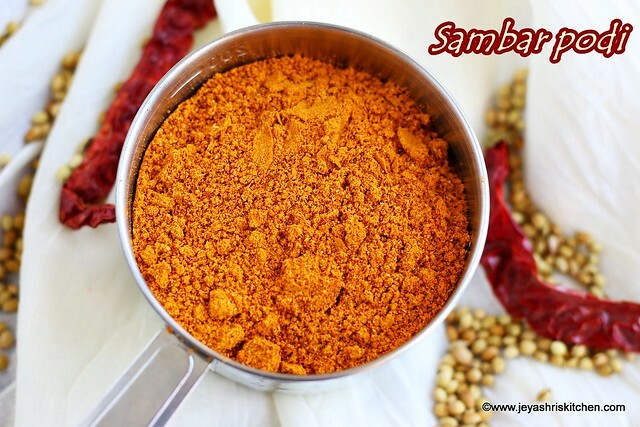 Description: Sambar powder recipe| How to make sambar masala at home, South Indian style Sambar masala made using coriander seeds, red chili and other spices used for making sambar, rasam and curries too.. In a clean dry pan add all the ingredients except the turmeric powder. Dry roast for 2 minutes, till all the ingredients get the warmth. Let this sit in the same pan till it is completely cool. The main purpose of roasting is the make the sambar podi grind finely and easily. Alternatively you can microwave this for 2 minutes or keep it under the bright sun for an hour. Once it is cool, put this into a mixie. Ensure the mixie is dry. Grind into a smooth powder. I recently brought Preethi blue leaf mixie and it has done the job pretty well. This will stay good for 2 weeks, always use clean dry spoon while handling this. Aromatic fresh sambar masala is ready. Some people add cumin seeds to Sambar powder but we don't add it. 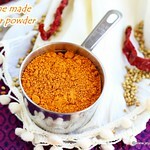 Color of the podi depends on the variety of chilli used. If you want to add cumin seeds, add 1 tsp of it while roasting for Home made Sambar powder. We don't add asafoetida in Sambar powder. It is added to the Sambar or rasam while making it. Quite new to me, Thanks for sharing.